Book has a durable polypropylene cover with stylish nylon stitching. 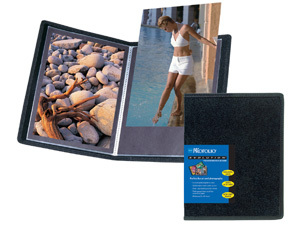 Clear, top-loading pages and black paper inserts to hold images up to 8-1/2x11. With a stylish nylon stitching and value price, the Art Profolio Evolution from Itoya is the next big thing in art and photo storage! These portfolio books are available in all the same great sizes as the Original Art Profolio.